The last time I played a motorcycle combat game was Road Rash on the PC. That was a long time ago, so when I saw Road Rage coming out, I hoped it would be a spiritual successor that could fill that niche. The idea of knocking enemies off their bikes with a bat, crowbar, or even a sword, sounded like a great time. Now that Road Rage is here on the PS4, does it present a fun and action-packed open world to explore, or does it induce the wrong kind of rage in the player? The city of Ashen is the setting for Road Rage. A short opening fills in the backstory. These gangs are rising up against oppressors who have forced them to live in slums while they grow fat on their profits. The class struggle seems like a good setup, but Road Rage doesn't do much with the setting or story. In fact, the rest of the game's narrative is delivered through narrated text messages that appear between missions. The writing here is forcibly vulgar and doesn't feel natural in practice. Instead, it just comes across as awkward. This is further exacerbated by the voice acting, which feels very amateurish. Lines are read with stiff narration, and when characters try to sound angry, it doesn't feel authentic. I really wanted to like the story of Road Rage, even if it was just text messages, but it never tells us anything that pushes the narrative forward. Furthermore, the narration can often result in cringe-worthy moments that take away any chance for the story to shine. Of course, I would be willing to look past this, to a degree, if the gameplay was compelling. Sadly, that's not entirely the case. The gameplay in Road Rage holds the spark of potential, but it's consistently snuffed out as various glitches and control issues take center stage. From the moment you're literally dropped into the world, everything feels loose and unpolished. The handling of the bikes, even with upgrades, never feels reliable. They have a floaty feeling to their turn radius as if you're suggesting that you should turn and the bike is resisting your input. Heavy use of the brakes and the handbrake make the controls a little less cumbersome, but the controls never feel tight or responsive. This becomes an even bigger issue when you factor in the wonky physics. Passing through solid objects or hitting invisible walls is common. Sometimes you can even wipe out without realizing that you hit anything. You thankfully respawn fast, but it simply shows you falling several feet on your bike and landing on the ground. It's a little too arcadey and clashes with the tone of the game's world and story for me. Likewise, the variety of events to participate in showcase some cool ideas, but they each come with their own caveats. 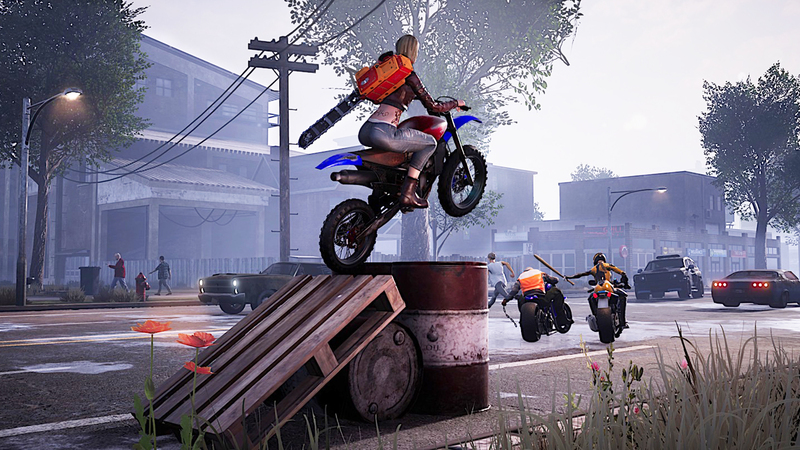 The motorcycle combat you came for is here, but the unresponsive controls make it more difficult than it should be to line up a swing and take out enemies. Their A.I is pretty basic, so they won't put up much of a challenge, but wrestling with the controls can be extremely frustrating. Time trials work fine but again suffer from the control issues. The stunt challenges give you the chance to score some air on ramps or pop a wheelie, but offer little else in the way of actual stunts. The only other way to earn points is to pass close to cars without crashing, which is a lot harder than it sounds given the physics and controls. I did have some cool moments during the motorcycle combat, especially when I upgraded my bike and weapons. The upgrade menu where you spend your cash on events offers a variety of drivers, bikes, and weapons to purchase. Specific upgrades to the bike's various stats are also an option, but they don't have enough of an impact to fix the issues. As a result of the unpolished gameplay and glitches, the game comes across as unfinished in a lot of ways. It's really a shame to say that, because the potential is there. If the game had received more polish and tighter controls/combat, it could have been really fun. The open world would still be lifeless and a little bland, but the game would have been fun if these things had been fixed prior to launch. Instead, the asking price feels like you're paying for an early access title that will, for all intents and purposes, never be finished. Unfortunately, the issues extend into the game's presentation as well. The graphics are very simplistic and lack a lot of detail. This wouldn't be an issue if they were stylized or sharp, but they look muddy and blurred in a lot of places. Menus feel unresponsive, often taking several seconds to register an input when you're trying to purchase upgrades or navigate weapon options. 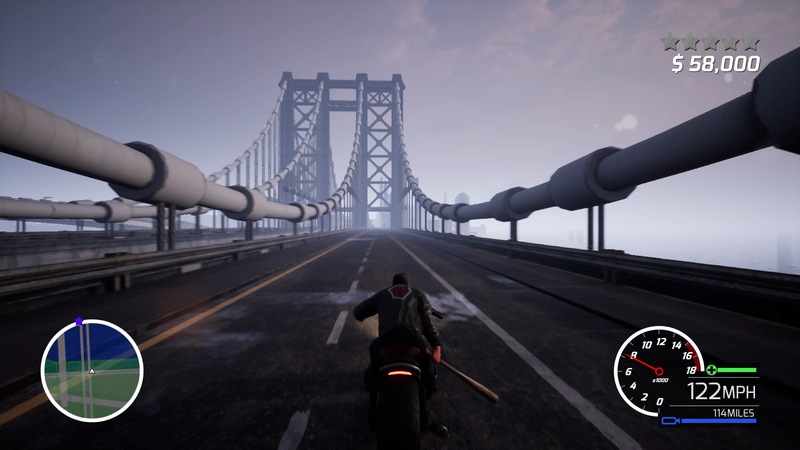 Road Rage is one of those games that I went into with an open mind and expectations for some fun motorcycle combat. Unfortunately, the game's controls and lack of polish made it impossible to truly enjoy my time with it. Had it been given more time to be refined and tested for some of the glitches and physics issues, this could have been a very fun little arcade racer. Instead, it just feels too unfinished to be worthy of a recommendation.